EBR Systems, Inc., a Sunnyvale, Calif.-based developer of a wireless cardiac pacing system for heart failure, raised $50m in funding. The round was led by M.H. Carnegie & Co. and Brandon Capital Partners with participation from prior investors Split Rock Partners, Ascension Ventures and Dr. Thomas Fogarty’s Emergent Medical Partners. Led by Allan Will, Chairman and CEO, EBR Systems has developed WiSE™ (Wireless Stimulation Endocardially) technology to eliminate the need for cardiac pacing leads, the major source of complications and reliability issues in cardiac rhythm disease management. 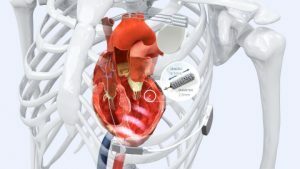 The company’s initial product eliminates the need for coronary sinus leads to stimulate the left ventricle in heart failure patients requiring CRT. Future products will address wireless endocardial stimulation for bradycardia, and other non-cardiac indications. EBR Systems intends to use the funds to conduct its global SOLVE-CRT study. The company’s wireless pacing system is not currently available for commercial sale in the United States but has received European CE Mark approval for its second-generation wireless transmitter and conducted initial cases at four European clinical centers.